Cholangiohepatitis is a disease of the liver and biliary system commonly seen in middle aged to older cats, but can be seen at any age. Clinical signs of disease include jaundice (yellow pallor to the skin, whites of the eyes, and gums), inappetance, vomiting, diarrhea and painful abdomen. It is a serious disease, but responsive to treatment in the majority of cases. To fully explain the pathophysiology of disease, it is first necessary to briefly describe the biliary system, pancreas, and liver of the feline. 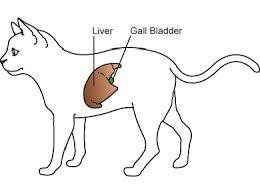 The biliary system of the feline begins with the gall bladder, a pouch about the size of a ping pong ball that lives nestled among the lobes of liver. It stores a greenish fluid comprised of bile acids. The gall bladder empties into small vessels called canaliculi that travel through the liver en route to the bile duct, that then empties into the upper small intestine. Shortly following the digestion of a meal, the gall bladder contracts and sends bile acids into the canaliculi that travel through the liver. In the canaliculi, the bile acids go through a conversion to bile salts that are then deposited through the bile duct into the upper small intestine. This is one of the early stages of digestion, where the bile acids help to break down fats and proteins into smaller, more absorbable structures. The pancreas also is involved in the digestion process in the upper gut. In response to a meal, it secretes digestive enzymes that travel down the pancreatic duct and get deposited into the upper gut to aid in the breaking down of proteins and fats. What makes felines unique is that the pancreatic duct does not have its own exit opening in the upper gut. Instead, is empties into the common bile duct, sharing the same orifice as the biliary system. The reason that this is significant is that disease of the biliary system as is the case with cholangiohepatitis, sometimes leads to disease of the pancreas as well (more on this below). Cholangiohepatitis usually begins with inflammation of the upper gut. This inflammation may come from dietary indiscretion or primary infection, but in most cases is the result of inflammatory bowel disease. In fact, a recent study showed that 80% of cats affected with cholangiohepatitis concurrently had inflammatory bowel disease. Whatever the source, the inflammation of the gut leads to a disruption of GI flora (digestive bacteria that aid in digestion) and subsequent bacterial overgrowth. The bacteria then ascend up the common bile duct, make their way to the bile canaliculi thereby infecting the liver, then finally infecting the gall bladder. So what starts out as an infection of the gut has now become an infection of the gut, the biliary system, and the liver – hence cholangiohepatitis. In about 50% of cases of cholangiohepatitis, pancreatitis results because of the pancreatic duct’s close proximity to the bile duct and the risk of infection ascending and reaching the pancreas, further complicating the affected cat’s presentation. Diagnosis of cholangiohepatitis includes hallmark clinical signs, such as jaundice (yellow pallor of the skin, whites of the eyes , and gums), dehydration, fever, depression, painful abdomen. Laboratory findings include high white blood cell count, elevated liver enzymes, elevated bilirubin, and in cases where the pancreas is involved, elevated pancreas enzymes and positive testing on an assay called feline pancreatic lipase immunoreactivity (FPLI). Ultrasound guided biopsy of the liver is also commonly done to confirm diagnosis to rule out other liver diseases that can mimic cholangiohepatitis. Treatment for cholangiohepatitis consists of IV fluids, antibiotics, and anti-nausea injections if vomiting. Once vomiting is controlled, I will offer cats food as soon as possible, preferably a low residue, highly absorbable diet. It is important to get these cats eating as soon as possible to prevent a complication known as hepatic lipidosis (aka, fatty liver syndrome). If they will not eat voluntarily, I will try an appetite stimulant, and if that does not work, I will blend a low residue diet into a slurry and syringe feed the cat, place an esophageal feeding tube if the feline patient cannot hold down the syringed food slurry (esophageal feeding tubes are easy to place and may remain in place for feeding and medicating for 2 weeks). Another helpful (and from my perspective, essential) treatment for cats with cholangiohepatitis is treating with a compound known as a choleretic, that is, a compound that loosens bile secretions stored in the gall bladder and bile ducts and facilitates their out flow into the intestine to relieve sludging of the gall bladder and bile ducts. This also helps to release stored toxins that accumulate in the sludge within the liver and gall bladder of patients afflicted with cholangiohepatitis. The most commonly prescribed choleretic in in veterinary medicine is ursodiol. Some cats that have recovered from a bout of cholangiohepatitis require indefinite daily therapy to prevent relapse of disease. Prognosis is generally fair to good with most cats making a full recovery with aggressive treatment. However, relapse is common, most likely because inflammatory bowel disease seems to be the driving force behind development of disease in most cases. Therefore, vigilant feeding with a low residue or hypoallergenic diet for management of underlying inflammatory bowel disease is a good strategy for prevention of inflammatory bowel disease. In some severe cases, maintenance treatment with an immune suppressant such as a steroid or cyclosporine (as well as previously mentioned choleretic ursodiol) is necessary as well to control inflammatory bowel disease to ultimately reduce the risk for relapse of cholangiohepatitis.